In August 2006, the Yankees swept the Red Sox in a five-game series in Boston and ended the Red Sox’ season. It was a glorious four days with wins of 12-4 and 14-11 in a doubleheader on Friday, 13-5 on Saturday, 8-5 in 10 innings on Sunday and 2-1 on Monday. This weekend, the Yankees can end the Red Sox’ season once again and all they really have to do is win once at Fenway Park. With the Yankees and Red Sox meeting for the third time this season, I emailed Mike Hurley of CBS Boston because that’s what I do when the Yankees and Red Sox play. Keefe: It’s feel like forever since the Yankees and Red Sox played and therefore it feels like forever since I was up in Boston taking in the first Yankees sweep at Fenway Park since 2006. Unfortunately, I missed the 2006 Boston Massacre as I had to sell my tickets to one of the doubleheader games being made up from Johnny Damon’s Fenway return that May, and I never got over missing out on being there for the five-game sweep and the end of the Red Sox’ 2006 season. This weekend I will be on the West Coast for this series and once again will miss out on the opportunity for the Yankees to end the Red Sox’ season, much like that August 2006 series. But we have so much more to talk about before we get to what could be the end for the Red Sox. Let’s start with how we got to this point. And by “this point”, I mean, how we got to the All-Star break with the preseason AL East favorite Red Sox turning back the clock to 2012 and 2014 with another last-place worthy performance. Hurley: It should be noted that you never – ever – do one of these things when things are going well for Boston sports. Red Sox and Bobby V are going down in flames? Podcast! Patriots lose in the playoffs? Podcast! DeflateGate accusations? Email exchange! So it’s not surprising to see you pop up in the inbox with the Red Sox in last place before the All-Star break. How’d we get to this point? We know how we all got this point. The Red Sox pitching was atrocious for the first month of the season and has yet to really recover. The starting staff used to be worst in the majors in collective ERA; now they’re fourth-worst. That’s over-simplifying things, of course, but the teams worse than the Red Sox in starting ERA – Milwaukee, Colorado, Philadelphia – all find themselves in last place as well. No starting pitching, no bueno. Keefe: How dare you say I only contact you when things aren’t going well for Boston teams. That couldn’t be any less true. The Yankees have 77 games left. If they go 39-38 in those games, they will finish 85-77. The Red Sox would have to go 44-32 just to tie them. I don’t think the Yankees are going to play .506 baseball the rest of the way and I’m pretty sure the Red Sox aren’t about to go on a .579 run. What does all of this mean? 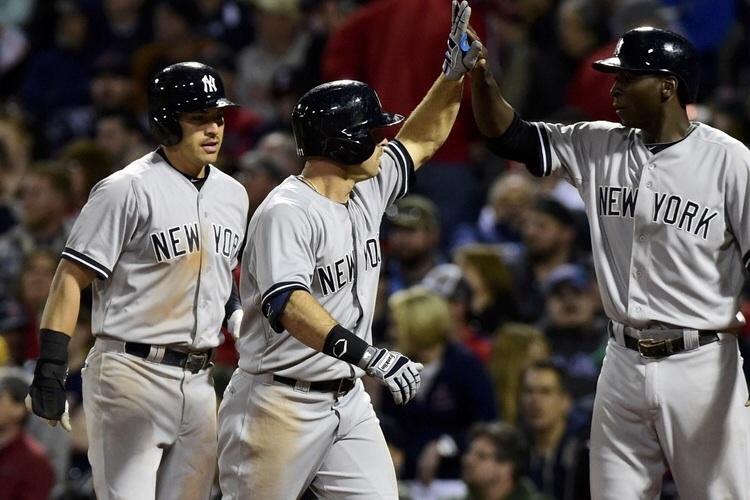 It means the Yankees basically have to win just once this weekend to keep the Red Sox at bay. That will give them a five-game lead in the loss column for the “second half” with three more games off the schedule. All of the pressure is on the Red Sox and I wouldn’t want it any other way. Hurley: Yeah. Optimism is running a little too high around here. The Red Sox have won 9 of 13 and 13 of 19. It’s a nice run. But it’s not going to keep up. I choose to look at the entirety of the Red Sox season, as well as what the Red Sox have been the past four years. I know they won it all in 2013, thereby ruining your life and making you mad to this very day, but they put forth an epic choke in 2011, they crapped the bed with Bobby V. in 2012, and they were the most boring last-place team in sports history last year. I know what they are. People can make reasonable statements about their chances, such as the games back, the number of games left in the schedule, blah blah blah. But just look at how many games this team has given away due to bad pitching, idiotic mistakes or a combination of both. They are what they are, and I don’t think the past two weeks means they’re suddenly a new team. But here’s my question: I follow you on Twitter. I read your columns. I would be hard-pressed to find an instance of you saying one positive thing about the Yankees this year. You drooled all over A-Rod a lot, but then you complain about Joe Giradi’s use of him. You seemingly hate the outfield, and the infield, and the starting rotation. What makes you so confident that the Yankees are a plus-.500 team from now until the end of the season. Keefe: I only complain about bad baseball decisions, bad baseball players and bad baseball plays. If Joe Girardi wants to give players a day off on a Wednesday after having a day off on Monday and having another one on Thursday, I will complain. If the Yankees want to take their best first-half starter (Adam Warren) and put him in the bullpen as a right-handed specialist while they continue to give CC Sabathia starts and then have the Steinbrenners apologize to us at the end of the season for not giving us a championship and that’s their only goal, I will complain. If Brian Cashman signs Stephen Drew to a one-year, $5 million deal and then continue to give him at-bats, despite hitting .181/.257/.374 and citing “bad luck” over a two-year span, I will complain. If Brett Gardner, an All-Star this year, decides to try to steal third with no outs or one outs in a game to get into what I call “better scoring position” and then gets thrown out, I will complain. I only complain about things that are worth complaining about. The one spot where maybe I am wrong is with Mark Teixeira, given the 2009 throwback season he is having, but I’m not someone who lets three good months erase three years of not playing because of ridiculous injuries and underachieving when playing. The thing that gives me most confidence with the Yankees is that they are in first place right now after having Masahiro Tanaka out from April 23 to June, Jacoby Ellsbury out from May 19 to July 8 and Andrew Miller out from June 9 to July 8. Wednesday was the first time they had their supposed best starter (Tanaka), best all-around player (Ellsbury) and arguably best reliever (Miller) since April 23, yet they managed to not only stay afloat, but stay at the top of the division. If hundreds of at-bats for Didi Gregorius and Stephen Drew, first-base and left-field appearances from Garrett Jones, starts from CC Sabathia and relief appearances from Esmil Rogers and David Carpenter couldn’t derail the Yankees’ season without their star players for so long, I have to believe in this team. On the other hand, I can’t believe you don’t believe in Rick Porcello (and his $82.5 million contract), Wade Miley, Joe Kelley, Justin Masterson and Clay Buchholz! Right now the only Red Sox pitcher that scares me is Eduardo Rodriguez and I’m expecting him to throw a complete-game, two-hit shutout this weekend. Hurley: I wasn’t necessarily saying your complaining wasn’t without warrant, though most of the time it is. And then when the Yankees win you never say anything. You’re the worst. Anyways, Eduardo Rodriguez absolutely saved the Red Sox season. They were spiraling out of control and no starter could get to even the fourth inning. The kid is awesome. Buchholz has been pretty great too. He’s got a 1.99 ERA in his last 10 starts. But all it takes is a butterfly to land on his shoulder and he’ll spend the next two months on the DL. I don’t think anyone’s banking on him the rest of the way. I could sit here and make a case for the Red Sox much like you did yours. They’re actually getting standard production out of every position now except first base, and probably right field. And I do think they’re a little bit better now than they were in May. But even if I can see them playing better baseball, and even if I can see the Yankees slipping, I can’t see the other three AL East teams simultaneously falling apart to give the Red Sox an avenue to the postseason. That would just be so miraculous, it would be stupid to talk about it seriously. Still, a sweep one way or the other this weekend, and things get really interesting. If either team takes two out of three (WHICH ALWAYS HAPPENS FOR CHRIST’S SAKE), I will be thoroughly bored. Keefe: I do talk when the Yankees are winning and am very supportive of A-Rod, Betances, Miller, Gardner, Chris Young, Tanaka, Pineda and Chasen Shreve though that’s about it. I think Friday is the most important game of the series for the Yankees with Pineda starting. Ivan Nova has only made three starts (two great, one bad) since coming back from Tommy John and with Rodriguez pitching, that game is not likely to go well. That leaves us with Sunday where Nathan “Hits” Eovaldi is sure to give up 10 hits in five innings and Wade Miley is likely to give up his share too. However, that Sunday night game will probably end up being the 2-1 game and the other two will be blowouts. I just hope Pineda shuts down the Red Sox on Friday, Buchholz implodes early like he did on Sunday Night Baseball in the Bronx in April and the Yankees win that game, quiet Red Sox fans and make the Saturday and Sunday games much less important. But I’m not stupid enough to think that is going to happen. No game and no lead has ever been safe Yankees at Fenway Park and I wouldn’t be surprised if the Yankees lost the first two games of the series. That would make Sunday a must-win and that would mean my weekend in Los Angeles/San Diego will be ruined. Why can’t the Red Sox just go away and then all of the attention can be on Tom Brady and his suspension, which is how I’m sure you want it anyway. Hurley: I was looking up Eovaldi earlier. An 8-2 record with a 4.55 ERA? That is ridiculous. He gets over seven runs of support each start. I think even Neil Keefe could win games with that kind of run support, and I’ve seen him pitch a Wiffle Ball, and he is absolute garbage. A part of me wants the Red Sox to sweep, because that’ll make for an interesting July, August and September. But another part of me likes to watch the world burn. Please don’t tell that to anybody in Boston though. Keefe: If you mean having a career Wiffle ball ERA of somewhere around 0.50 as “absolute garbage” then I guess that phrase fits the bill. Well, I figure you already have all of Pittsburgh, part of Canada and Indianapolis hating you, so you should throw your hometown of Boston into the mix. There is too much optimism in Boston, or at least that’s the feeling I get, about the Red Sox considering that even with a sweep of the Yankees this weekend, they will enter the All-Star break under .500. I don’t care how crammed the AL East standings are, playing under .500 for this long shouldn’t give anyone optimism, so it’s refreshing to hear that you aren’t in that boat. And since you’re not in that boat and you want to become the next generation’s Dan Shaughnessy, why not dust off that Yankees hat you made your day buy you when you were a kid and jump on board? There will always be a seat for Michael F. Hurley on the Yankees train. Hurley: I guess I could refer to the time to when I was the Albert Pujols to your Brad Lidge as “garbage,” but then I would be discrediting my own greatness. So I won’t do that. I’ll say you were a pretty good Wiffle Ball pitcher. Until you met me. Yeah, I might have thrown my arm out that day and my arm strength has never been the same, but at the same time I destroyed your career for several years, so it was worth it. I won’t be a Yankees fan, but I will say, when my men’s league team needed a new name, I pushed for the Yankees. I kind of liked the idea of showing up to fields around Massachusetts in full pinstripes, just having everyone who sees us be disgusted and full of rage. Turns out I was the only one on the team who liked this idea. Oh well.